Known for his hip-hop and reggae style, Jewish musician Matisyahu's sold out show Sunday night at Boulder's Fox Theatre proved to have attracted far beyond the religious folk of his faith. While a considerable amount of Jewish families with women in their head dresses and men in their customary yarmulke could be spotted from among the crowd, the greater majority of the audience showed to be just as diverse as the musical genres in performance. The music performed by Matisyahu and opening acts Trevor Hall and K'Naan did in fact all hold aspects of hip-hop and reggae, yet among these artists there was diversity. From acoustic guitar and vocals to bongo drums and keyboards, set after set, even song after song, the music was alive with world influences, sound, and meaning. Opening the night with a more grounded yet exalting set was acoustic/alternative South Carolina native artist Trevor Hall, accompanied on percussion by Chris Steele. Poetic lyrics backed by simple melodies picked and strummed on acoustic guitar, Hall's sound is greatly embodied in his unique voice. A difficult one to characterize, at times carrying the drone of Dave Matthews and at others the choked sound of Isaac Brock from Modest Mouse, Hall's voice is ornamented with fluxuations in pitch, giving his vocals a soulful, reggae sound. While this alone lends for a grasping show, it was the intense percussion accompaniment by Steele that really gave depth to Hall's set, making for a yet stronger, world sound. With a more exotic, African beat, Steele's percussion worked beautifully with the basic simplicity of Hall's guitar and accented vocals. A change of pace was thrown into the set when Matisyahu stepped on stage and encouraged Hall to read a poem only recently written. Strumming on his guitar, Hall recited the poem with eyes closed and not one person stirred for those couple of minutes, but instead kept in silence with a fixation on the stage. Following, Hall and Steele again picked up the remainder of the forty minute set, closing with a song of amazing climatic tension of rising tempo that only increased the crowd's awe and appreciation, earning Hall and Steele a wild applause equal to that received by Matisyahu. Maintaining the energy and interaction of the audience, though with a more hip-hop, afro-beat sound, following Hall's set was K'Naan, a native of Somalia. With the sound turned up, the bass of the band's music was carried alternately in the large bongo drums and standard drum set. His vocals expressed more in a hip-hop style, K'Naan's set musically held more up-beat with heavy bass and rhythm. As this may be so, the influence and incorporation of other cultures' music shows to have been just as prominent. Mixing musical styles with a great talent and understanding of it, K'Naan's set varied from song to song, from old school hip-hop, to modern hip-hop vocals with an Ethiopian musical basis, to a very personal a'cappella sharing his story. In this short solo performance and in so many other songs, K'Naan's lyrics take a focus on his growing up in Somalia, his life in America. Combined with his smiling, dancing, and just simple feel good demeanor throughout the entirety of his forty minute set, K'Naan's performance built on a connection with the audience that made for a fun, moving atmosphere. Getting the whole crowd involved as one mass group in singing the chorus "When I get older I will be stronger. They'll call me freedom, just like a waving flag," K'Naan's set ended with a sense of unity and elation that too was brought to a close with an equally excited, energy packed applause. Anxiousness and excitement followed during the long wait through the set change as the theatre packed to its capacity. Shortly after ten o'clock, Matisyahu at last took the stage for an unexpectedly long jam-packed set of special guests and musical improvisation. Aside from Matisyahu himself, dressed in an open black blazer with white Nike's, a yarmulke, and prayer tassels, the remaining three members of his band looked like a group of average guys, just walked off the street in their everyday attire. Regardless of their dress, the show was about the music, and the instant they hit the stage, the crowd met their performance with lively dancing and singing as the temperature rose. During the second half of the first hour of his set, Matisyahu surprised the audience, bringing out guests Mackenzie Roberts and Jonny 5 from local rising band, Flobots. For almost the full length of the song played together, Roberts accompanied on viola, while for only a portion of it did Jonny 5 join in with improvised vocals. An unexpected treat, the crowd welcomed the Colorado musicians, keeping up the energy and enthusiasm. This atmosphere reached pinnacle heights when, at the end of the first hour of his set, during the song "Jerusalem" Matisyahu started pulling kids in front of the stage up onto the stage with him. After the first three were up, Matisyahu needn't say or do more - kids just started storming the stage on their own. One after another, the stage filled with a good 20-30 dancing bodies surrounding Matisyahu, himself downstage center singing and dancing along. If that wasn't enough, after an announced five minute break, Matisyahu and the band came back on stage, ready as ever to pick up where they left off. Again, more towards the end of this second part of his set, Matisyahu brought another guest out, this time around it being opening act Trevor Hall. 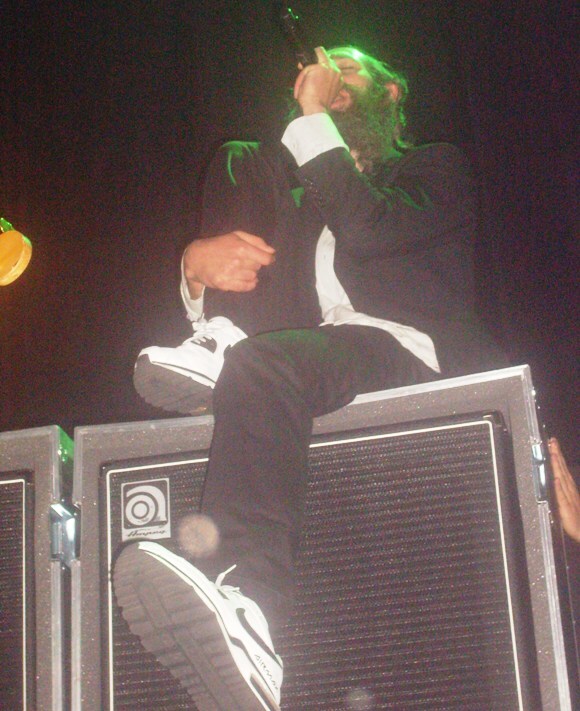 Playing a song they had written together, Hall's time on stage with the band, like so much of Matisyahu's performance, was largely improvised. While at one point the music stopped to take care of some technical sound problems, the audience strongly convinced Matisyahu into beat-boxing. At this request, the band left the stage, leaving Hall on his guitar, playing as support, and Matisyahu, beat-boxing to whatever Hall put out. For a good five minutes this session went on, ending with a climbing tempo back and forth between Hall's guitar and Matisyahu's vocals moving as fast as both could entertain. Bringing the band back on stage, the set continued, ending with a drawn out, extended jam session of "King Without a Crown," only to be followed up by yet one more song in the final encore. By the time the show ended shortly after one in the morning, the audience had nearly cut in half as people slowly left sometime during Matisyahu's immense three hour set. With improvisation making up a large portion of every song, the performance on a whole took on a very jam-band like stylization, bringing to light a respectable virtuosity, connection, and understanding among each musician. Five hours after the show started, those left in the crowd and the musicians on stage were indeed looking tired and beat. But for all that is was worth, the show put on not only by Matisyahu, but just as much so by Trevor Hall and K'Naan was of the most passion, fun, and zeal, leaving their audience simply sublime.